PROG ROCK MUSIC TALK: Classic Rock/Progressive Rock Review: Styx-Pieces of Eight-SACD Ltd. Numbered Ed. 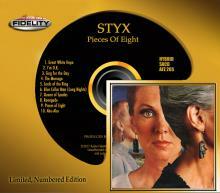 Classic Rock/Progressive Rock Review: Styx-Pieces of Eight-SACD Ltd. Numbered Ed. Styx has always been one of my favorite bands, they still are and always will be. So, what is it like to be a lifetime fan of a band and you are still listening to their music? It holds some meaning for folks like myself. The music never sounds old or outdated and you are not expecting anything different…well sometimes it does happen. Consider this point, what is like for a music fan to hear the music they have been listening to for the last 30 to 40 years and suddenly it all sounds crisper, brighter, and clearer than ever before? Well, I can tell you it can be a revelatory experience to hear this music in the SACD format. The SACD release by Audio Fidelity last September of Pieces of Eight rocks and I heard things I have never heard before. This is what this format is intended to accomplish. I am here to tell you the job was well done (again) by Audio Fidelity. I am little late to the party but nevertheless I am reporting in to all of the respective lifetime rockers and audiophiles. Pieces of Eight was a multiplatinum release and with good reason. The music offered radio friendly rock at the time and it was also a nod to the progressive elements of the band. The prog sounds came through loud and clear for this listener, however when I first heard it as a teenager I thought it just rocked. Which it did and still does, I just became older and more educated somewhere along the way. Pieces of Eight is a very strong release right up there with the high echelon of prog rock releases like Grand Illusion but it rocked a bit harder. So, dare I say more metal this time around? It is there, all of it in its raging glory - rock, metal and prog. Anyone that liked to crank up the tunes can appreciate all of those genres coming together in an explosion of sound. That felt good to get all that off my chest and let y’all know how I really feel about this music. So, get yourself a copy before they run out again, even if you have all the other formats, you need to hear this SACD!